I made a brief visit to our search area from November 14-16. Because I was alone, I mostly avoided the more difficult and remote locations and focused on more accessible areas where possible encounters have taken place. This includes our current camera traps. The weather was a problem – steady moderate rain from 7:00-10:30 am on the 15th and early morning drizzle, moderate winds, and cloudy skies on the 16th, which was also the opening day of duck season. On that day, I ventured farther into the swamp and encountered one duck hunter in an area that appears to get very little human traffic. There was frequent gunfire throughout the morning and into the afternoon; however, even on this day when people were hunting for deer and ducks, I saw only four trucks parked along the parish roads, met two people on the road (one of them having just rescued two hunters who had gotten lost.) This was roughly the same level of traffic as we encountered on the opening day of squirrel season in October. Compared to other places I’ve visited in Louisiana, this is a fairly low level of human pressure, although between the gunfire and the weather, avian activity was suppressed on the 16th. Even the crows were less vocal than usual. On the morning of the 14th, temperatures were in the mid-20s at sunrise. 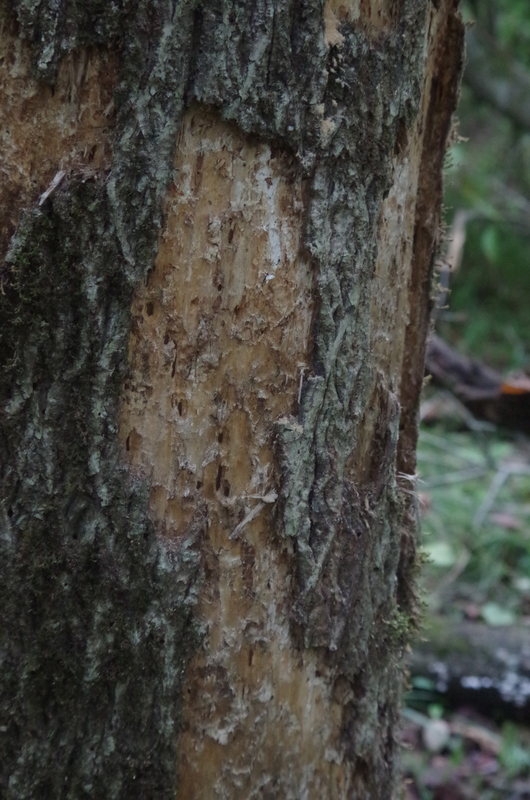 I visited the camera traps and found what may have been fairly fresh bark chips at the base of one; however, I couldn’t identify any areas of fresh scaling on the tree. Frank Wiley will be servicing the cameras and changing the cards in the near future. Time will tell whether anything was captured this time around. At 9:15, near one of the camera traps, I heard three kent-like calls from the ENE. They sounded very clarinet-like in tone, more so than some of the other calls we’ve recorded. The calls were very close together temporally, and I wrote that the cadence was “not quite what I’d expect.” At 12:55, I was in a different location and heard two more intriguing calls from the SSW (also SSW of where I was at 9:15). A Blue Jay was calling roughly simultaneously from a different direction. I consider both of these incidents ‘weak possibles’ because I was alone and because the calls were so few in number. On the 15th, I spent most of the morning in the field despite the rain, giving up at 9:30 am. The skies cleared at around 11, and I spent part of the afternoon exploring some habitat to the east of our hot zone. One of our group members has made several visits to this section, but I had only spent one morning there. Because it was unfamiliar territory, I chose to walk the bank of the bayou that bisects it. The understory along the bayou is dense and predominantly comprised of holly, which made for tough walking (and also made it difficult to look for and photograph feeding sign.) I was only able to go about ¼ mile in an hour at which point I turned back. 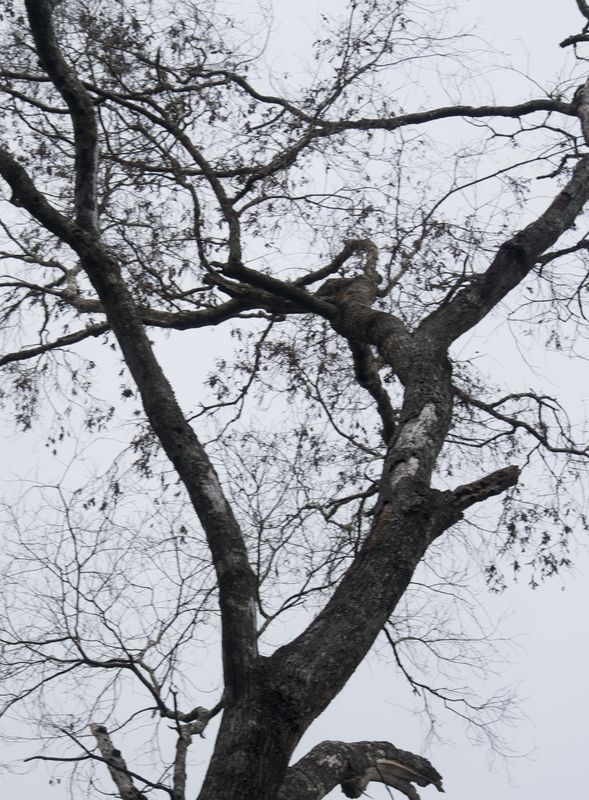 Although I covered very little ground I did find an abundance of feeding sign, including a recently dead snag that had been scaled in the manner that I think is diagnostic, and multiple examples of the scaling on higher branches that is consistent with what Tanner described. 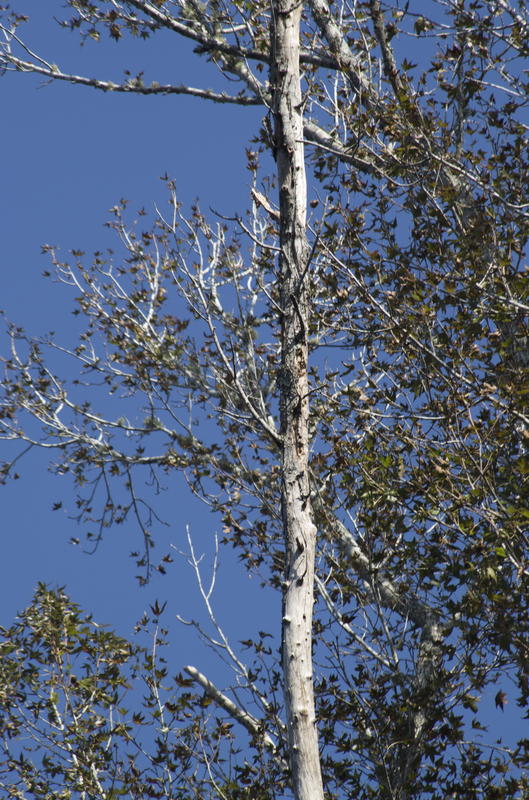 The high branch scaling appears to be older, but the work on the snag seemed recent, with fresh bark chips on the ground, so it may be an active feeding site. I’ve included some images to illustrate. Due in part to weather conditions (which made looking for feeding sign a challenge) and gunfire I did not see or hear anything significant on the 16th, although I went deeper into the swamp following a familiar route. 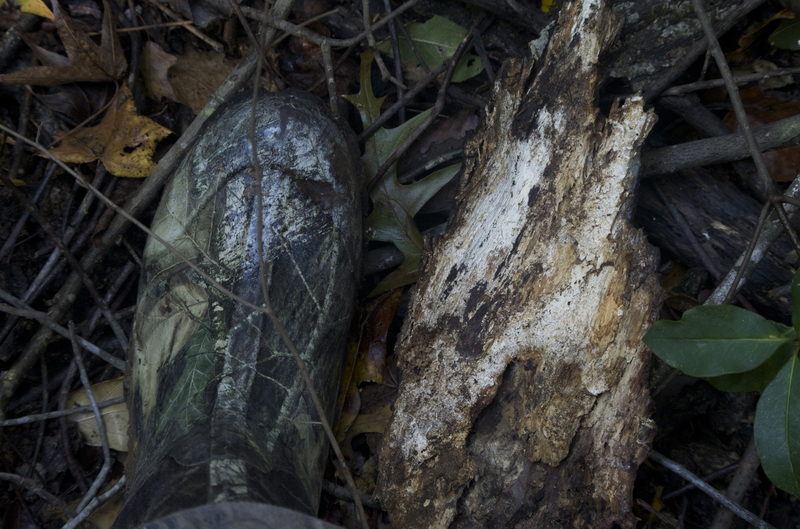 About 2.5 miles in, I came very close to stepping on a large cottonmouth as I stepped over a downed tree. Its mouth was wide open, and it was ready to strike when I spotted it. Just a reminder of how dangerous it can be to wander around alone in the swamp. I just returned from another visit to the new Project Coyote search area. I have a book coming out in February and will be unavailable during what’s typically considered peak search season. I plan to make 2-3 more trips between now and mid-January. Frank Wiley’s work responsibilities have kept him out of the field since August 1st, except for a very brief visit a few weeks ago. 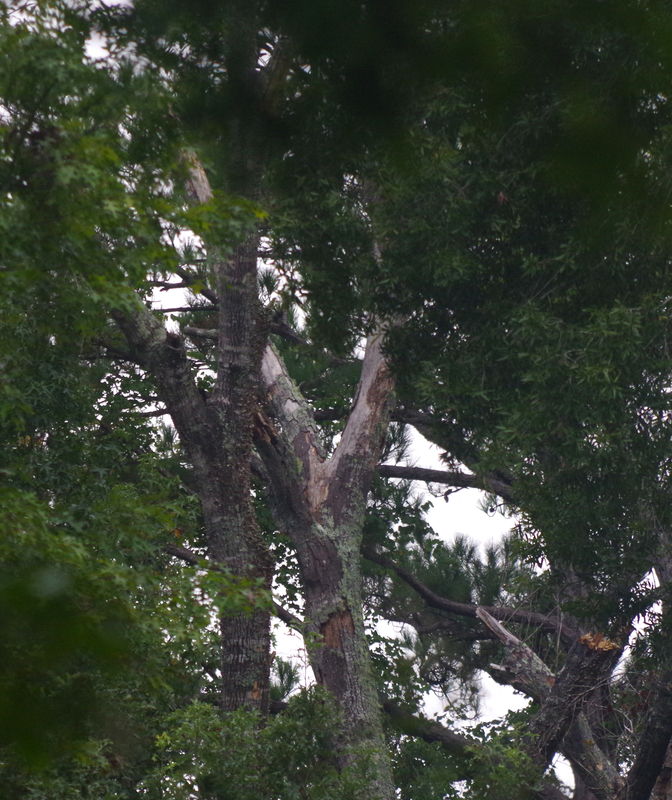 There have been no indications of recent woodpecker work of any kind on the target trees described in the July 6th update. I found another promising and recently scaled feeding tree in the same general area, and we have moved one of our two Reconyx cameras to that location. 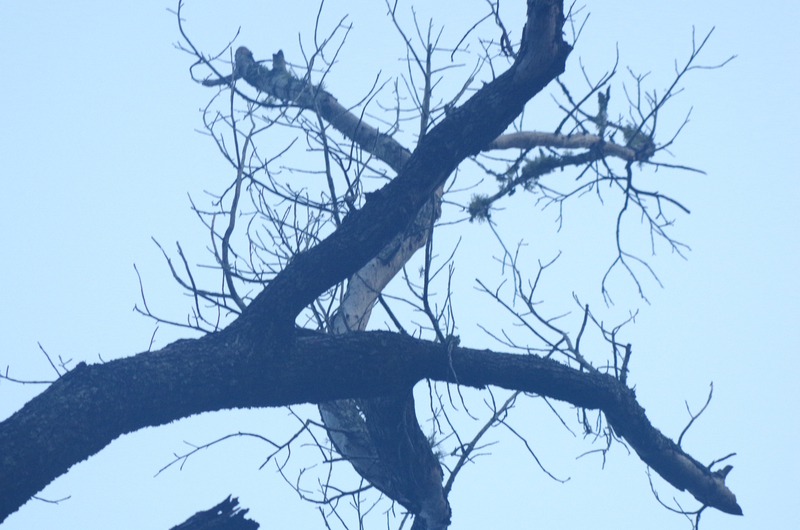 The trip was a very valuable one for a number of reasons, and assuming that Ivory-billed Woodpeckers are present, we may have some new insights into their behavior. Weather conditions were extremely difficult from October 2nd through October 5th. Although insects and ticks were nowhere near the issue they were in July, the heat was nearly as intense, and humidity was so high that pre-sunrise hikes into the habitat left binoculars and camera lenses fogged and bodies drenched in sweat. On October 4th, a sudden rainstorm at a time when forecasts predicted a 0% chance damaged or destroyed my camera and ended the field day shortly after noon. Frank Wiley joined me on the 5th, and we were caught in a similar but shorter storm that did nothing to bring down the temperature and added an additional layer of unpleasantness to our late afternoon hike out of the habitat. Conditions were more moderate on the 6th, with the humidity way down and temperatures in the 70s. 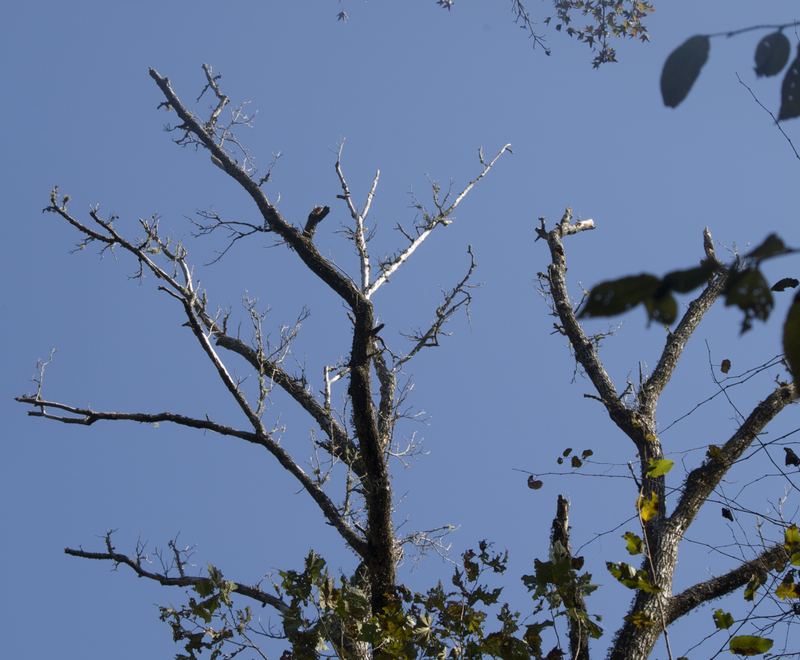 It’s also worth mentioning that this weekend was the opening of squirrel season in Louisiana, so there were there were quite a few people in the area, but mostly on the outer edges of the swamp. From Friday-Sunday, gunfire was frequently audible, especially between 7 and 10 am. I arrived at the location on Wednesday afternoon and spent a couple of hours in one of our hot zones. I did not see or hear anything suggestive. Thursday and Friday were somewhat more interesting, as I discovered some trees that had been fairly recently scaled, including the one on which we’ve now focused a camera (Figs. 1 and 2). While the photographs show work near the base of the tree, there was similar scaling higher up on the bole. The top of this snag had blown down, but death was recent, and the the bark was tight and hard to remove with a hunting knife. 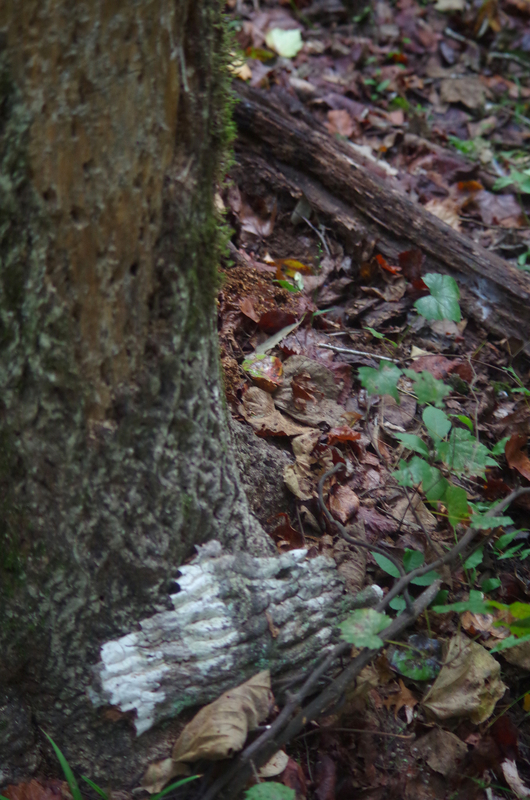 I also found a feeding tree that had both fresh and obviously old and weathered scaling (Fig. 3). This lends further support to the idea that ivorybills return to feeding trees many months apart; we observed something similar on a scaled tree in our old search area in 2010 but did not have a camera on the tree when the second round of scaling took place. We suspect the return visits are a response to Cerambycid life cycles, and it appears that scaling takes place both in and out of breeding season. This suggests that maintaining camera traps on suspected feeding trees for extended periods may prove to be a fruitful approach, so we plan to leave our cameras in place for the foreseeable future. We’d welcome input from entomologists about beetle egg laying, pupation, and emergence, as this might eliminate the need for leaving cameras in place for months on end and enable us to deploy them on suspected feeding trees at optimal times. Over the course of the visit, I noticed a good deal of high branch scaling similar to that described by Tanner and consistent with the appearance of other Campephilus woodpecker feeding sign (Figs. 4-6). On Thursday and Friday, October 3rd and 4th, I heard isolated ambient double knocks while I was in the vicinity of the feeding tree discussed in my July 6th post. There have been numerous auditory contacts in this area in recent months. Nevertheless, I do not have a high confidence level with regard to these particular sounds, especially because they were isolated and no second observer was present. On Saturday, October 5th, Frank and I visited the area a few miles to the north where we heard the loud single knock in July. It still remains largely unexplored, but the parts of it we’ve visited are magnificent, top quality habitat, with numerous large trees, abundant standing dead wood, and almost no signs of human activity. At approximately 11:00 am, we heard a single knock that came in apparent response to a series of ADKs. At 1:30 pm, we heard an ambient double knock. In both instances, we agreed about the quality of the sounds (including that they were unlike the gunfire we had been hearing on and off throughout the day) and the direction from which they originated. Conditions on Sunday, October 6th were a dramatic departure from the preceding days. A front had passed through well before dawn, so the temperature and humidity were moderate. We were into good habitat in the southern search area by sunrise. At 8:28 am, we heard a series of kent-like calls to the northeast of our location. Frank heard two in close succession, the second note lower than the first; I counted six altogether but missed the descending second note. We agreed that they were consistent with other suspected Ivory-billed Woodpecker calls that we have heard and recorded in this area and those we heard and recorded in January 2010 in the old Project Coyote search area. To my ears, these calls are somewhat similar to the ‘kik’ call of the Cooper’s Hawk (with which I am very familiar) but richer and less harsh in tone. After retrieving one of our Reconyx cameras and moving it to the new suspected feeding tree, we headed north to adjust the placement of our other camera. This is where I heard ambient double knocks to the northeast on Thursday and Friday. At approximately 1:45 pm, we both heard two double knocks to our southwest. These appeared to come in response to and within five minutes of a series of ADKs that Frank had performed. Frank heard a third double knock two to three minutes after the first two, but I missed it. Two to three minutes after Frank heard the double knock, we both heard a single knock, apparently from the same location. We waited an additional ten to fifteen minutes and heard nothing further, leaving the location at a few minutes after 2 pm and walking in a southwesterly direction. At 2:15 pm, I heard several kent-like calls, identical in quality to the ones heard earlier in the day. I stopped and asked Frank, “Did you hear that?” He indicated that he had not, but another call followed, and it was readily audible to both of us. We agreed that the calls seemed to have come from the same general area as the double knocks we had heard approximately a half-hour before. As we discussed what had been an extraordinary day, even for this area where the possible contact rate has been extraordinarily high, Frank noted that no kent-like calls had been heard since early March, when another searcher and I heard and recorded suggestive calls in the morning and afternoon, this despite frequent visits to the area by several searchers, including Frank’s almost daily presence from late June until August 1st. Frank has been in the field at all seasons, and I visited the former search area into June in 2010. We are not aware of having heard any suggestive calls before October 1st or after mid-April and certainly not any series of calls. 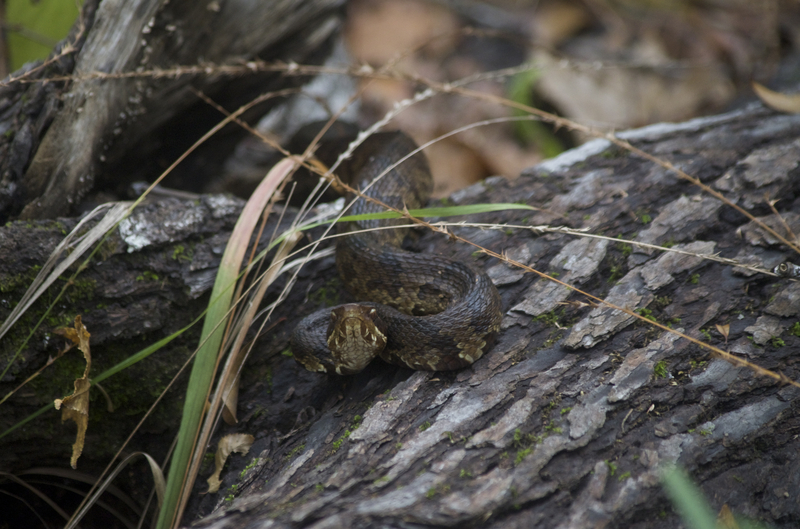 We are aware of kent-like sounds being recorded during summer in other parts of Louisiana but suspect that calls are rare during the late spring and summer months and that the dramatic change in weather conditions and the first cool day of the year may have triggered the vocalizations. 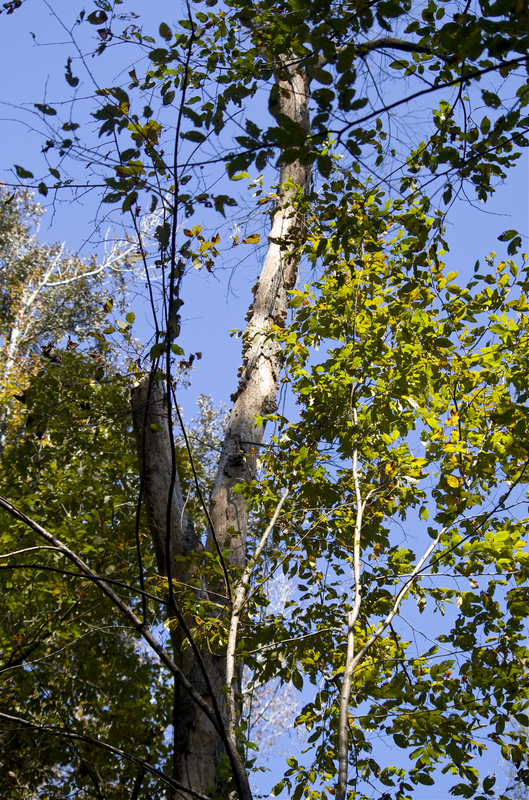 Edited to add: I have re-examined the high branch scaling in Figure 6., and on a closer look, there are indications that the bark has been scaled in layers. 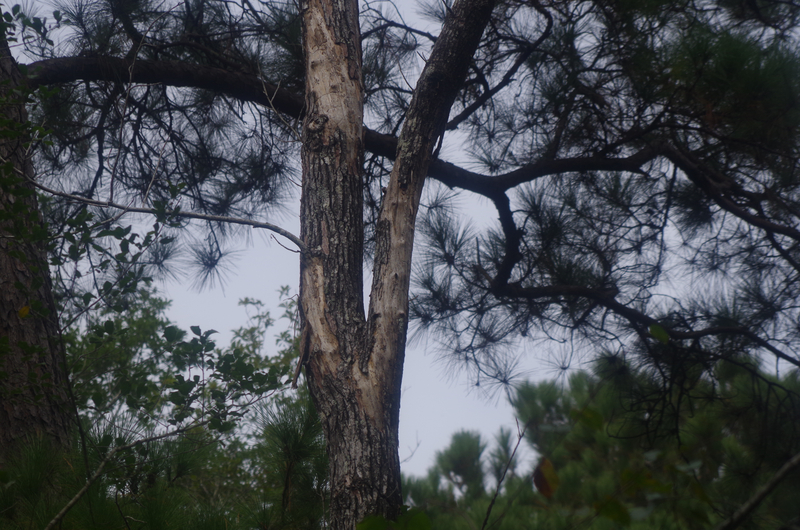 I will leave the image up, but I think it may well be Pileated Woodpecker work; it is certainly not what I would classify as Grade A. The other posted examples do not share this layered appearance. While I always look for ‘Tanneresque’ scaling, it has been my view for some time that (Tanner notwithstanding) the most suggestive and perhaps diagnostic work can be found on boles rather than on high branches.